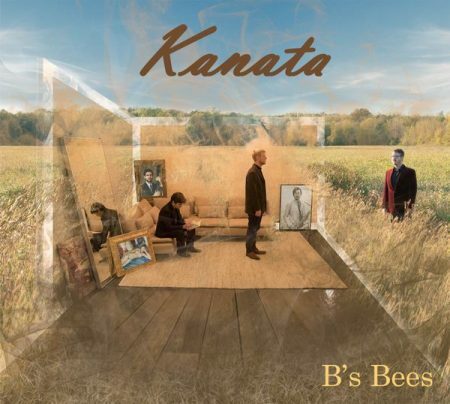 Montreal’s busiest jazz band, B’s Bees, recorded their new album Kanata during a highly inspired, post-tour interlude. Their third album displays their vast, exciting style of play and shows growth in the group’s compositional and improvisational abilities. A native of British Columbia, drummer and bandleader Brandon Goodwin has been a mainstay in the Montreal music scene for over a decade. In his last five years there, he experienced an exceptional period of creativity as a composer and non-stop performer with his group B’s Bees. After a successful first U.S. tour in April/May 2017, the group returned to Montreal and headed directly into the studio. Titled Kanata, the new album displays the group in a brilliant new quintet setting. They haven’t stepped too far from the Hard Bop-inspired sound they are known for nor allowed themselves to be boxed in by a genre label. Their new recording shows what they can do when given a blank canvas, seizing the moment to show their collective and individual growth. The album was produced by Goodwin and released through his label Django Heart Records. The band and new album also feature Bees bassist Alec Safy. Now based in NYC, he is originally from Buffalo. Pianist Joe Ferracuti hails from Ottawa, and guitarist Julien Sandiford from Halliburton, Ontario. On this recording, the band features a special guest, Japanese saxophonist Masashi Usui. A superb jazz player, Usui has called Montreal home for several years. His fiery and lyrical playing is the perfect spark for the group, whose members have the ability to display technical brilliance but most often choose melodic content over flash. Other band members also contributed compositions to the disc. Track 5 is swing piece, “Nothing Yet,” composed by pianist Joe Ferracuti. It has a winding melody that moves through unexpected harmonic colors before returning to a simple motif. Ferracuti also composed the Track 6 ballad, “Refuge,” and another swing composition, “Atomic Future,” on Track 7. Suggesting a dystopian reality, the song uses harmony that bends and distorts in a manner evocative of a nuclear meltdown. Guitarist Julien Sandiford wrote the music found on Track 8. “For and Against” is based on a motif that follows through a series of keys.